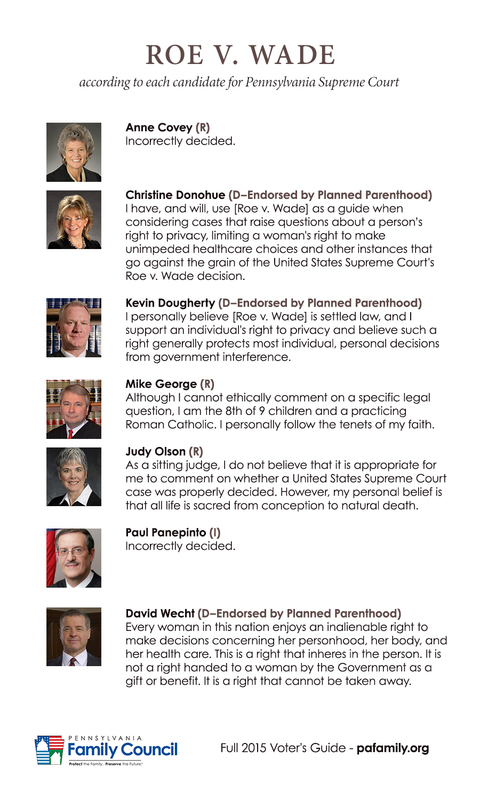 Pennsylvania Family Institute Where do the PA Supreme Court candidates stand on life? I don’t want my money spend on Abortion. Do not want my money spent to murder and that’s what planned parenthood is doing. Not any more than mulation of inocent babies. I cannot vote for anyone like that, no matter what party they are. Will not vote for anyone who is not pro-life. To Mr. Wecht, the law can’t have it both ways with a woman’s right to her own “personhood”, to her body, and her healthcare when it comes to abortion, but count prostitution as a crime. Not that I think prostitution is a good thing, but if a woman’s body is her own, then it’s her own in all circumstances, wouldn’t you agree? Will vote as will my wife for Pro-Live Candidates and those who have expressed President Reagan and Conservative Judges, etc. Praying much for many to turn out to vote. Not to vote is a vote. Our freedom ends when it involves the innocent murder of another. The unborn child has rights at conception. Adoption is the only sane choice for a mother would is not able to parent. If scientist found a tiny cell of algae on another planet, they would jump for joy at finding life. It would be the biggest news story ever. However, a beating heart is stopped inside a mother’s womb and you call that beating heart a “choice”. The blood needs to be on the hands of the voters. Abortion needs to be on the ballot for every voter to be responsible for their stand. For those who profess to know God. It is written in Jeremiah 1:5 Before I formed you in the womb, I knew you. How can you vote for someone who believes that you can murder the person that God has formed in the womb. The blood is on all the hands of those who vote with pro-murder. Ask any child if there are circumstances in which it is ok to murder an unborn baby. You will not ask them. It is too horrifying a question.